Family firms are often portrayed as very traditional, even conservative organizations that treasure the status quo and are unwilling to break away from their proven ways of doing business. At the same time, however, some of the most innovative firms in the world are family firms. Think of Mittelstand companies, many of them hidden champions, which lead the innovation league tables. In a recent study my coauthors and I found that even though family firms invest less in innovation than nonfamily firms, these firms exhibit a higher rate of innovation output . More specifically, even though family firms invest less in R&D, these firms nevertheless generate a higher innovation output, such as in the form of new products and patents. Interestingly, family firms were not only more efficient in converting innovation input into innovation output, but are also more innovative in absolute terms in comparison to their nonfamily counterparts. What are the reasons for this puzzling effect? We can attribute this surprising finding to three central family firm characteristics. First, family firm owners typically hold controlling stakes in their firms. This gives the owners a tight grip over strategic decisions and also innovation processes in their firms. Second, family owners often have most of their wealth tied to the firm. Some studies report that on average families in business have 80% of their wealth vested to the firm. This makes these owners highly exposed to the risks their firms are running. Finally, many family business owners see their firms as more than a financial asset. Next to financial wealth, these owners typically also derive reputational advantages from their firms, cherish benevolent relationships with stakeholders, and seek to uphold family control for the long run, most often with the intent to pass it on to future generations. These central attributes lead family firms to invest less in innovation. For instance, the unwillingness to share control and open up equity to nonfamily investors limits the investment potential for innovation. Wealth concentration in turn limits the willingness to undertake investments with uncertain paybacks, such as innovation. Finally, the close ties with stakeholders, the emotional attachment to the existing structures, processes and people make family firms hesitant to heavily invest into novel ways of doing business, which would typically be disruptive for the existing networks and knowledge base. Interestingly, though, the very same attributes that lead to lower investments in R&D provide the basis for a higher innovation output. For instance, a high degree of control and exposure to the risk of uncertain activities leads to better monitoring of innovation processes and avoids waste. In turn, the trusted relationships within family firms, not only among family members but also with employees, clients and the wider stakeholder community provide these firms with strong knowledge advantages, deep information exchange, and trusted networks. In consequence, family firms are able to turn the scarcity of innovation input into abundance of innovation output. Figure 1 illustrates these considerations. As part of our study we also explored the role that a family CEO at the helm of the firm may have for innovation input and output. 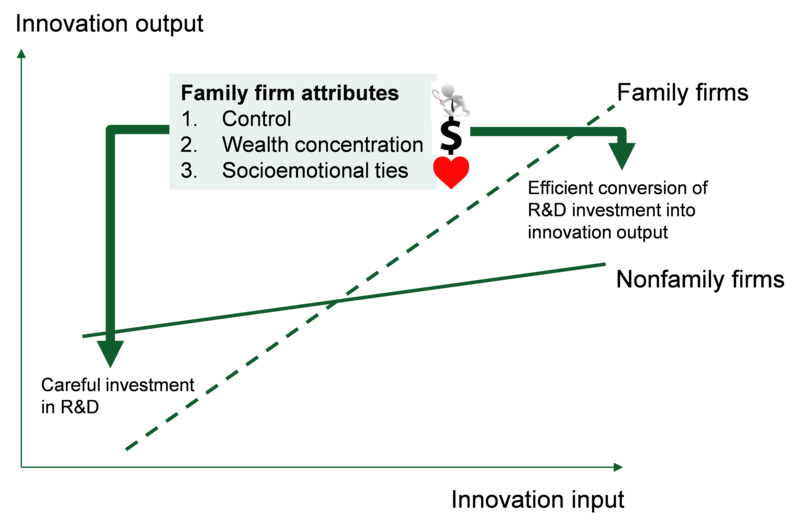 Interestingly, we find that a family CEO reinforces the effects described above. When the CEO stems from the family it is even more likely that family firms will be parsimonious with uncertain investments in R&D. But for the investments they undertake, the family CEO will assure that the firm makes the most out of it. This finding is important for practice, since it challenges the idea that family firms should “professionalize” management, which is often equated with replacing family leaders with nonfamily leaders. Family CEOs seem to be crucial for efficient innovation processes, and replacing the family CEO with a professional manager may do more harm than good, at least in terms of the firm’s innovativeness. Family firms have an incentive to carefully monitor that the limited investments the firm can make into R&D are put at their most efficient use, and actually result in innovations that have a market. In this process, innovation controlling is essential. While early stage innovation may require a lose form of control, such as by defining maximum available resources so that eventual losses remain within acceptable scope, at later stages of the innovation process tight monitoring along business plans may be in order. Innovative family firms nurture a trusted atmosphere within the top management team, be the team members family or nonfamily. Relationship quality fosters trust and a mutual understanding, both of which are important to plan for innovation and ultimately growth. Replacing family members with nonfamily members at the helm of the firm may undermine the close ties and trusted relationship that are so important for innovation. Innovation requires that information is accessible for decision making. For privacy reasons, families in business sometimes withhold important information about the operational and financial condition of the firm from the decision makers in the firm. Such behavior inhibits information access and flow that is crucial for employees to come up with innovations. Long-term employees often do not have fancy degrees and high education levels. Their implicit knowledge about production processes, clients and markets, however, represents an important resource that is valuable to refine processes, improve products and develop service levels. Proven ways of doing things provide the springboard from which new ways progressively emerge, are refined and are brought to perfection given the long-term view of the firm. Innovative family firms make sure that employees understand that innovation is integral part of their daily job. Many long-term established family firms look back on an impressive history of innovations. This tradition of innovation should ideally become a source of inspiration and new innovations. This is true not only for firms with rather stable business models. Firms that are able to look back on a repeated history of coming up with new ideas and the ability to absorb and weather through the setbacks that naturally accompany innovation processes, will find it easier to break out into new fields of activities. Networks are central for innovation, not only since the internet era. Networks with clients, suppliers and opinion leaders in the industry provide access to credible and timely information, such as about recent trends and new demands. Family firms often possess long-term and trusted network partners and thus typically possess an information advantage through their networks. Highly innovative family firms keep in mind, however, that old networks can become a liability, which leads decision makers to confound the consistent information they are receiving from the network with the stability of the environment. Networks that bind can become networks that blind. Innovation can only take place in a corporate culture that cherishes also its inevitable side effect, failure. By definition, innovation projects are risky, both in terms of payoff and timing. Therefore, innovation champions will also value a failed, but well-executed innovation project. A large German Mittelstand company, for instance, not only celebrates the innovation successes. It officially parties the “Burying the failures” ceremony, wherein failed innovation projects are given credit and lessons for new projects are derived. Family firms thus make us aware of an important, yet largely overlooked characteristic of great innovators, namely not to focus on input or output alone, but on the efficiency with which input is converted into output. Limited input generating higher output, hence doing more with less, points at a paradox. In fact, paradoxical situations are omnipresent and inherent in innovation processes. For instance, companies need to focus on the long run if they want to come up with groundbreaking innovations. They can, however, only do so if they have the means in the short run to finance the farsighted endeavors. Similarly, unfettered R&D spending may lead to endless spirals of trial and error. Therefore, great innovators emphasize not only exploration, but also exploitation, that is to say efficiency. Family firms seem to be particularly good at managing these innovation paradoxes. A great example of a family firm that has learned how to cope with these innovation paradoxes is the Italian company Beretta, founded in year 1526. This firm has chosen “Prudence and Audacity” as its motto. The motto epitomizes the idea of being cautious and thoughtful in its actions while at the same time proactively embracing new trends. This strategy has served the company well, for nearly half a millennium. It may well be a model for some more centuries to come. Thomas Zellweger holds the family business chair at the University of St. Gallen, where he also directs the Center for Family Business. He holds degrees from the University of St.Gallen and Université Catholique de Louvain. After two years in investment banking with Derivative, Brussels, he received his PhD from the University of St. Gallen in 2006. He was a visiting professor at Babson College, at the University of British Columbia and at the University of Witten/Herdecke. Thomas serves on multiple editorial boards. His research has been published in leading academic journals, it has received several international awards and it has been discussed in The Economist, Forbes, New York Times, CNBC, The Times, just as in the leading German speaking media outlets. Thomas is a member of three supervisory boards of family firms in Switzerland.